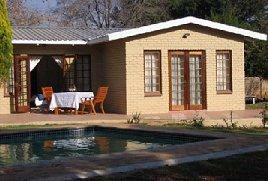 Blue Periwinkle B&B, is situated centrally in gauteng in the tranquil village of Irene, Centurion. Enjoy the peaceful and country atmosphere convenient for Centurion, Midrand, Pretoria, Supersport Park, and the N1 motorway. Blue Periwinkle offers 2 luxury rooms. Our Rose room offers either a King size bed or two single beds, while our Lavender room has a double bed. Both rooms have en-suite bathrooms and separate shower. Their kitchenettes are equipped with fridges, microwaves and tea/coffee making facilities. SABC TV1,2,3 and ETV are available and each room has a separate entrance. Visit the historic home of Jan Smuts or shop in the modern Centurion shopping malls. Secure parking is available. Enjoy access to the swimming pool from your own patio. Choose B&B or self catering.